CHICAGO — The second quarter had only three possessions, and all resulted in scores, as the Bears took a 13-10 lead into halftime on Sunday at Soldier Field. The Bears got their running game going and the Packers got sloppy on the first possession of the quarter. RB Matt Forte carried 10 times for 62 yards, and the Packers were flagged for offsides three times, the most damaging coming on the Bears field goal try after the defense held in the red zone. The field goal was good, but the Bears chose to take the penalty to set up a fourth-and-1, and Forte picked it up to make it first-and-goal. Forte then took it in from 1 yard out on third down, giving the Bears the lead at 10-7 with 7:49 left in the half. The Packers came back to tie the game on their next drive. 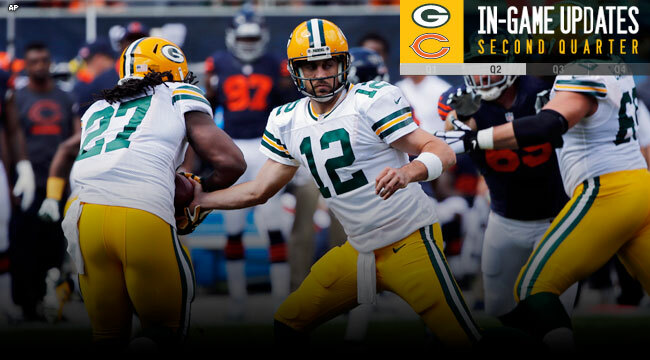 QB Aaron Rodgers took advantage of a free play with the Bears offsides to hit WR James Jones for a 34-yard gain. He then connected with WR Davante Adams for 21 yards to get the ball in the red zone. But two holding penalties on Green Bay halted the drive, and the Packers had to settle for K Mason Crosby’s 37-yard field goal, making it 10-10 with 2:32 left in the half. The Bears threatened to score again on the final possession of the half. An 8-yard run by Forte and a 12-yard scramble by QB Jay Cutler converted third downs and got the Bears across midfield. Another third-down conversion on a pass to WR Marquess Wilson moved the ball to the edge of field goal range. K Robbie Gould drilled a 50-yard FG with 8 seconds left to put the Bears back on top, 13-10.